Dynasty has some new company. Deadline reports Michael Michele has joined season two of the CW TV show. A reboot of the ’80s primetime soap, the drama series centers on the wealthy Carrington family and the energy empire they must defend against the Colbys and other adversaries, as well as each other. 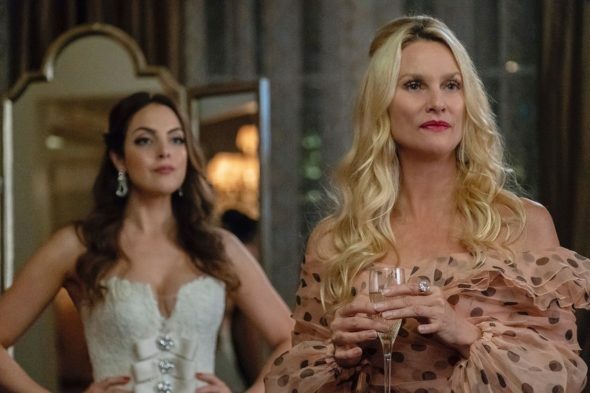 The cast also includes Grant Show, Alan Dale, Elizabeth Gillies, James Mackay, Sam Adegoke, Robert Christopher Riley, Rafael de la Fuente, Ana Brenda Contreras, and Maddison Brown. Michele will make her debut on the The CW series at the end of season two and may become a series regular for season three. Nicollette Sheridan (above, right), who plays Alexis, has announced that she is leaving the series. What do you think? Do you watch Dynasty? Do you want a third season? More about: Dynasty (2017), Dynasty (2017): canceled or renewed?, The CW TV shows: canceled or renewed? i love dynasty. alexis is being recast. i would like to see heather locklear or jamie luner as alexis. i am glad it got renewed. Awesome show. The only one I have to watch. Love the keep it going ….. I love this show and i honestly hope they keep it going!